As we get older, and hopefully wiser, we generally start to become more discerning on how we view the world and the problems we face. Many of us who seek to make the world a better place try to look at the problems, analyze them, and do what we can to correct them. However, because there are so many different problems facing us, this approach often overwhelms us and can instill a sense of hopelessness in our ability to create positive change. Looking more deeply into this situation, we discover that many of these difficulties are SYMPTOMS of much deeper problems, and that attempts to address these SYMPTOMS are not an effective or efficient way to bring about the changes we desire. One can compare this to having abdominal pains and visiting a doctor who offers you pain killers without investigating the underlying cause of the pains being experienced. If the pain is the result of a cancer or an ulcer, then the pain is only a SYMPTOM, not a ROOT CAUSE. Treating the SYMPTOM in this case is not an effective or efficient way to address the problem. It may bring about temporary relief, but ignores the ROOT CAUSE. A similar situation exists when we look at the wide range of issues we face as a society. Some of the issues include homelessness, lack of medical care, unemployment, high debt loads, widening wealth gap, declining schools, infrastructure neglect, fraying safety net, increasing government fees and tolls, etc. Trying to address each one of these issues individually becomes an overwhelming task. These issues are not ROOT CAUSES, but SYMPTOMS. If we take time to ponder and analyze each of these issues looking for a common thread, one can determine that they are all the result of money, more specifically the lack of money. This process starts getting us closer to the ROOT CAUSES. So how is it that as a society we can work so hard and still experience this lack of money? Consider this…. If you have a given amount of money in your possession or control, all of that money is available to you to spend. Once you give some of that money to someone else, it is no longer available to you and is now available to others. While this concept may seem to be quite elementary, this is the basis of where much of the problem lies. If one applies the same principle to a larger group such as a family, a community, a county, state and even nation, the result is still the same. Once money leaves the group, it is no longer available to that group. Understanding this brings us another step closer to the ROOT CAUSES. Most homeowners can relate to this. Let’s suppose that you have taken out a mortgage for $100,000. By the time you have completed paying off your mortgage, it will probably have cost you well over $200,000. The cost of the interest payments exceeds the original cost of the home. These interest payments are money that you and your family no longer have to spend on your needs. The same principle applies when a school district, municipality, county or other entity wishes to do a repair, a capital improvement or infrastructure project. The costs of these projects can easily double or even triple due to the interest charges. It almost seems insane, but we pay more to the financiers of these projects than to those who provided the materials and labor for the project. This does not even include the fees imposed by the bank on the borrowers. Now we are approaching the ROOT CAUSES. In California, the long awaited new Bay Bridge span was recently completed at a cost of $6.4 billion, which was 4 times over the initial projected costs. What most Californians don’t realize is that the total cost of the bridge will eclipse $13 billion when interest payments are considered over the life of the loans or bonds. So when we talk of projects costs doubling or tripling, it is not hyperbole. So exactly where does all this interest and fee money go when it leaves the community? It flows to the big Wall Street banks, enriching them, while impoverishing the community. This is the “Wall Street Tax” that effectively doubles or triples the cost of every project across every community in the nation. It is YOU, the taxpayer who pays this tax. Once the money leaves the community, it can no longer circulate locally and is no longer available to the community, exactly as described in an earlier paragraph. This is a ROOT CAUSE of why so many communities are struggling. To add insult to injury, these big Wall Street financiers are not even using their own money, they use other people’s money so they can skim the interest payments to line their own pockets. We have all seen how Wall Street has prospered since the 2008 crisis, while Main Street has been left to languish. So why do school districts, municipalities, counties and states (we’ll just refer to them as “communities” from this point on) use these big Wall Street financiers to fund their projects? It is because the costs of these projects usually exceed the ability of small local community banks to finance them. Additionally, because of capital requirements, the deposits of these communities can not be handled by the smaller local banks leaving only the big banks capable of handling such large deposits and transactions. This means that even the deposits of these communities which can include tax revenues, payrolls, and pension funds, are deposited with the large banks and therefore also shipped out the community,. These funds are then “invested” by Wall Street anywhere in the world where they can obtain the highest return. These funds are not being used to invest in local needs. This is another ROOT CAUSE for why Main Street has been struggling, while Wall Street has been thriving. With the current banking system we have witnessed the largest concentration of wealth in human history, while the vast majority of people have experienced stagnant wages, declining wealth, and recurring recessions. Maybe it is time to engage in some “out of the box” creative thinking? Wouldn’t it be wiser for communities to be able to obtain local funding at reduced interest rates where any interest payments would remain in the community and get recycled? Any good businessman would tell you that it is sound business to eliminate any middleman in a business transaction. Wall Street is nothing more than a middleman between funding and community needs, and if the Wall Street middleman was eliminated, more money would remain in our communities. How could this be done? There is another way to finance public projects and it is already happening across the world and in the state of North Dakota. North Dakota has its own public bank, the Bank of North Dakota. This bank has been in existence for a century and provides communities and businesses with low cost loans. Some examples of this: A new business in North Dakota can get a 1% loan for 5 years, student loans are available at below market rates with no bank fees, no town or county in ND has or needs a “rainy day” fund, they instead have the Bank of ND where they can obtain low interest loans should an emergency arise. The Bank of ND does not compete with community banks, but rather partners with them. There is a correlation between this partnering and the fact that North Dakota has the largest number of community banks per capita of all states in the nation. Additionally, the Bank of ND has only one office and no branches, no tellers, and no ATMs that compete with community banks. This partnering with local community banks means that the Bank of ND does not lend directly to small local businesses, but relies instead on the local community banks to originate those loans. The public state bank can provide funding beyond the deposit base of a small community bank allowing the community bank to finance projects it could not have financed without the partnership. If a local bank had a $5 million limit, and a business wanted $10 million for a new showroom, the bank would have to say no to the loan, forcing the business to go to a Wells Fargo, Citi, JP Morgan Chase or other large Wall Street bank. This results in the loss of business for the community bank. With the public state bank, the community bank could partner on the loan, raising its loan ceiling, retain the money in the community, and provide the services needed. One very important issue that needs to be raised is that of the safety of the loans being made. It is important to be sure that bank loans are made to people and entities that are truly credit worthy. In North Dakota there is a double check on this process. Any loan that a community bank requests a partnership with would require approval by both the community bank and the state bank officers, since both would be providing the funds. This results in a lower default rate as two sets of eyes are examining and approving the loan. There are those who may say that a state public bank could be at risk of failure and may need to be bailed out by the taxpayers. This was an issue that created much anger during the 2008 crisis. However, the Bank of ND was properly managed and did not need a bail out and in fact returned a profit of millions that year and every year since then to the state treasury. Politicians on BOTH sides of the aisle in the North Dakota Legislature love and support their state bank! How common is that? The proper management of the Bank of ND can be attributed to the fact that the officers of the bank receive appropriate salaries (far less than their Wall Street counterparts) and have no bonuses and therefore no incentives to take on excessive risk. The private Wall Street bankers are pressured by their shareholders to return high profits, which often leads to excessive risk taking rather focusing on the economic growth of the state and nation. Some of these investments could possibly be for things the community would not support or would even work against the best interests of their community. The public bank is required by its owners, which would be the people, to invest wisely to promote the economic vitality of the community. The prosperity created by keeping deposits locally and recycling the fee and interest money locally, would create new jobs, new businesses, fund “wish list” projects, and as a result would raise tax revenue. As more businesses thrive, the tax base and ratables would became larger, which could possibly contribute to tax cuts. A public bank is not limited to only states. Municipalities and counties could also form their own. There are public banks being considered in New Jersey, Philadelphia, Santa Fe, Vermont, California, Seattle, Los Angeles, Oakland, San Francisco and other places. These public banks have the ability to transform how communities obtain funding. It will keep deposit and interest money circulating locally and out of the hands of Wall Street, thus enabling our local communities to thrive. I would encourage readers to do their own research and discover how a public bank can tip the balance towards Main Street, rather than Wall Street, and help their small community banks at the same time. A good place to start is with the Public Banking Institute. Perhaps this is a good time to eliminate the Wall Street Tax that you are paying. 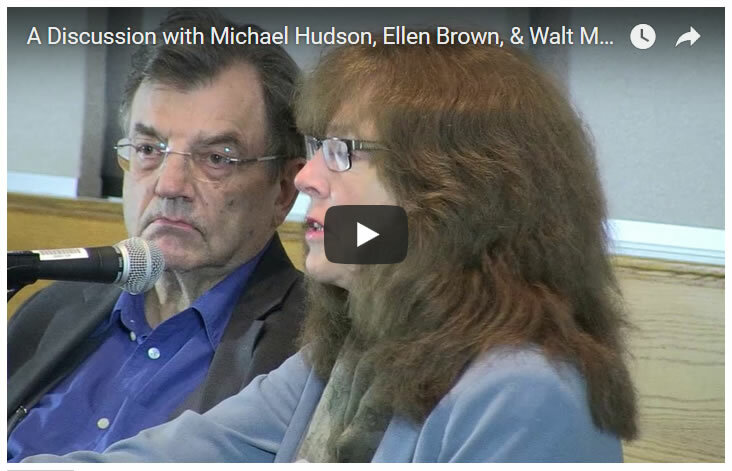 On Thursday April 6, 2017 two world-renowned economic thinkers, Michael Hudson and Ellen Brown, came to Franklin & Marshall College in Lancaster, PA to discuss how a public banking option can affect governmental effectiveness. This discussion was moderated by Walt McRee, the chair of the Public Banking Institute. This discussion which was open to the public focused on the key differences between government’s unquestioned reliance on private capital markets and how an entirely new, more productive arrangement could be devised. Kudos to Franklin & Marshall College for providing their students and community with such a high caliber seminar. The following video is that discussion. Rudy Avizius is a former educator and school administrator. He has been following the economic situation and the subsequent collapse for a decade now. He is concerned that the current economic, social, and environmental course we are on is not sustainable, and the time for real change is running out.